Pastor allegedly defrauds Mrs. Titi Atiku of N918 million – read shocking details. 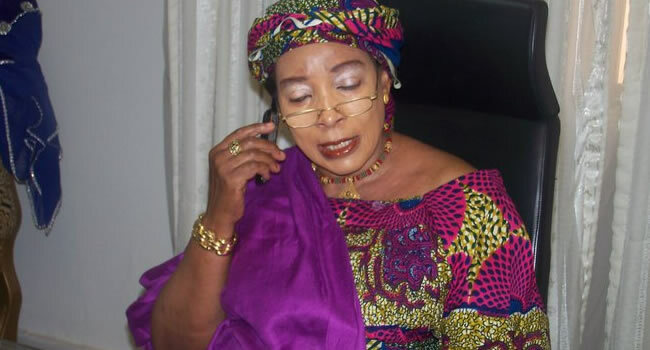 Mrs. Titi Atiku, wife of former Vice President Abubakar Atiku on Tuesday, May 23, told an Ikeja High Court, that she trusted a business partner who allegedly defrauded her of N918 million because of his status as a pastor. “I thought that the first defendant, being a pastor, he will not defraud me. “I thought that he was being genuine with me during our business dealings, “ Mrs Atiku said while being cross examined in the ongoing fraud trial against a pastor, Nsikakabasi Akpan-Jacobs, Abdulmalik Ibrahim and Dana Motors Ltd. Responding to Ibe’s questions about her identity when she married the former Vice-President, she said “I married my husband at the Ikoyi Registry in 1971. “I was a Christian before I married my husband, Angelina is my baptismal name, Florence is my confirmation name. “When I got married to my husband, I converted to Islam and I have been called Amina Titilayo, Titilayo was what I was called at home,” she said. 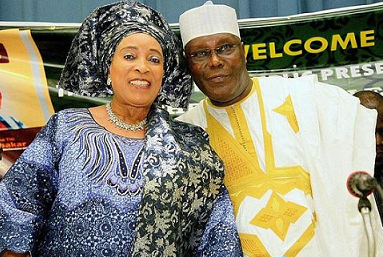 Ibe, however, still questioning Mrs Atiku’s real identity, told her that a book written in honour of her husband titled ‘Atiku: The Story of Atiku Abubakar,’ claimed that she was from a Local Government Area in Adamawa. “I am from my husband’s Local Government Area by virtue of marriage. “Whether I’m from the moon o, that’s not the matter on ground,” she said. Ibe, sought to tender the book written in honour of the former Vice-President to the court but it was rejected by Justice Oluwatoyin Ipaye. “The document does not fall under the definition of a public document under the Evidence Act, it is a private document, it is therefore rejected,” Ipaye said. THA Shipping Maritime Services Ltd, a company created in 2000 belonged to Mrs Atiku, Akpan-Jacobs and Fred Holmes. She was allegedly to be the majority shareholder with 49 per cent shares, while Holmes and Akpan-Jacobs each had 25 per cent shares. Akpan-Jacobs, who also doubled as the company’s Managing Director and Secretary, was accused to have gone to the Corporate Affairs Commission (CAC) and altered the share holding in his favour and forging the company’s board resolution. He allegedly under the new share arrangement allotted 70 per cent shares to himself and 15 per cent shares each to Titi and Holmes. According to the EFCC, welding a fraudulent shareholding power, Akpan-jacobs sold a property belonging to the company to Dana Motors Nigeria Ltd for N918 million. The property is located at Plot C63 A, Amuwo-Odofin Commercial Layout along Oshodi-Apapa Expressway, Lagos. During Tuesday’s proceedings, the defence disputed Mrs Atiku’s claims that she invested over N1.2billion into the business transactions with the defendants. “Your petition stated that you invested over N200 million and in another document it stated that you invested over N1.2billion, which fact is correct? “Do you have accounting reports, did you hire an auditor to look at the accounts, how did you arrive at N1.2billion? “N200 million is the money I spent in building the bonded terminal, by the time it was ready, it was worth N1.2billion. “Akpan-Jacobs never gave me any records, I was in the state service, I did not get any auditor, Akpan-Jacobs has the evidence of the money I spent, I didn’t know that our business transactions will become a court case,” she said. Mrs Atiku while in the witness box, accused Akpan-Jacobs of using her company property as a collateral for a bank loan that he sought when he wanted to run for the Akwa-Ibom gubernatorial elections. “He used my bonded terminal as a collateral for a loan when he wanted to run for governorship of Akwa-Ibom, when he couldn’t refund the money the bank wanted to acquire the bonded terminal, he sold it to Dana Motors Ltd. “I was the largest shareholder of THA Shipping Company with 49% of shares, my German partner Fred Holmes had 26% and Akpan-Jacobs has 25%. “Akpan-Jacobs never contributed a dime to the company, I couldn’t be involved in all the documentation because I was in service. “He did the registration and promotion of the company, he brought all the papers to me at the villa to sign, he later fraudulently changed the shareholding powers of my shipping company to favour himself. “He gave me 15 percent, Holmes 15 percent and he took 70 percent shareholding power for himself. “I never entered into a Memorandum of Understanding with him to sell the company, that is why I’m in court, when he couldn’t repay the loan, he sold the company to Dana Motors Ltd. “When the fraud happened, we initially agreed to settle out of court, but instead of settling, he went to sell the cranes and the company, giving the EFCC N16 million which I received,” she said. Akpan-Jacobs lawyer, asked the court to cancel the next court date slated for May 24 for continuation of the trial on the grounds of his Ill health. “My Lord, I ask for the previously adjourned date of May 24 to be vacated because I am currently battling ill health,” Ibe said. Mr Babatunde Sonoiki, the EFCC counsel however, opposed Ibe’s request. “There have been four adjournments at the cost of the plaintiff, she flies in at great risk to her safety from Abuja for every court date and she is supposed to be helping take care of a newborn of one of her children. “We have another witness who has traveled on four occasions for 15 hours by road from Yola and the case keeps being adjourned, I will like to request for a cost of N750,000 from the defendants to cover the financial expenses of the plaintiff,” he said. Justice Ipaye granted a cost of N100,000 against Akpan-Jacobs and adjourned the case until July 5 and 6 for the continuation of trial. Meanwhile, former vice president, Atiku Abubakar, said that the current structure of the country is not working and advocated for a restructuring for a better nation. It has been reported that Atiku spoke at an event to mark his conferment as “the Hero of Nigeria Democracy” organized by the Hall of Grace Magazine in Lagos. The All Progressives Congress chieftain called for restructuring of power that will see the federation units have more powers concentrated on them.